YouTube user KSIOlajidebt doesn't know how to pronounce my name, but he figured out my Twitter handle and has convinced dozens and dozens of his fans to send me a video. KSIOlajidebt, I've learned, has a problem. He's a hotshot video producer for Machinima, the online juggernaut that has partnered with some 4,000 other video-creators and has, according to the Los Angeles Times, more than a billion hits on its network of videos a month. 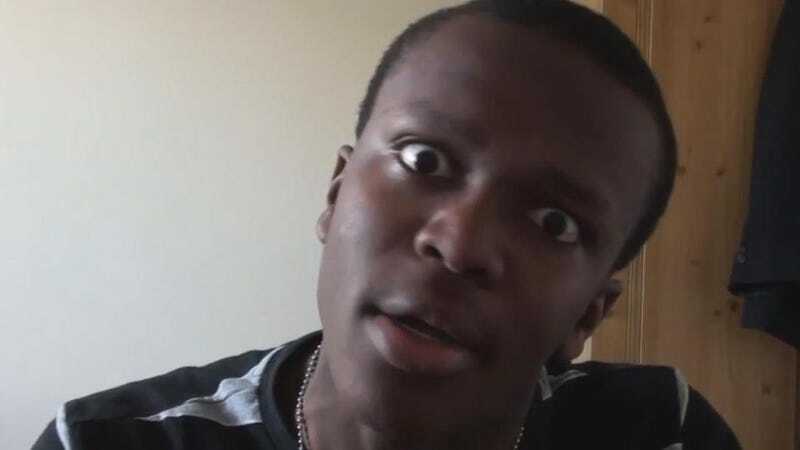 KSIOlajidebt is a star, really, regularly posting YouTube videos of FIFA video game matches that generate more than 300,000 or 400,000 views. They go live on his Machinma-affiliated channel. He and Machinima split the revenue. But now he wants out. "I am sick and tired of this," he says in a new anti-Machinima video he posted on his Machinima channel yesterday. His possible sources of sick-and-tiredness appear to be, as stated in the video, the concept that Machinima makes its money from YouTube users like him, that their support of smaller channels is "below par" and that, last year, when YouTube deleted his account for some reason, the people at Machinima, who he'd partnered with since 2010 and contacted for help, didn't know who he was. He seems to be most angry about his contract, which he says lasts to the end of time. "They downright refuse to allow YouTube channels to simply leave their network." Newer contracts lock Machinima video-makers in for seven years, he says. Through the video featured here (100,000 views overnight), KSIOlajidebt has implored his many YouTube followers to bring these issues to the attention of me, two other reporters and, for some reason the head of Call of Duty publisher Activision. He did not, however, respond to a request for comment. Judging strictly by the information publicly available on his Facebook page, KSIOlajidebt, real name JJ Olatunji, is quite young. He lists himself as attending a British prep school, graduating this year. Many online video producers who partner with the likes of Machinima are young and they enjoy something of a second career or modern-day part-time job that earns them money for school or the pleasures of teenage life or young adulthood. "Our program has grown to include nearly 4,000 partners around the world," a spokesperson for Machinima told me, "many of whom are now able to make creating content their full time jobs." Some of those producers even go on to earn full-time jobs at the thriving company. The Machinima rep says departures among those 4,000 partners are rare. "Of the entire group of partners, very few have ever had problems or issues— about one or two percent—over the past two years. Our goal is to create the most robust program in the space for aspiring creators of compelling video content that resonates with our global audience." It may well be that the IGN rates or other opportunities better than an endless or even seven-year contract may be what's really compelling JJ Olatunji to compel his fans to Tweet to me, and for one of those fans to declare that Machinima is "evil." We may simply be talking about young stars looking for a deal, frustrated that contracts they signed as teens or young adults gave more away than they realized. "Machinima has long term agreements in place with our channel partners to monetize their content," a company rep said, "because making channel partners successful is a long term commitment for us." One frustrated producer sounds a different note: "The fact of the matter is that we CANT speak out against them," they told me, "because they literally own our channels. Is it our fault for signing the contract? Yes. But you make the judgement whether or not a 16 year old can legitimately bargain with 'this is the only way you can make money.'" It's not clear how tied to Machinima JJ Olatunji really is, nor is it clear if Machinima, faced with a disgruntled producer would really stick to a contract or just let them go. But we may be seeing how a new breed of video game star here—the bedroom video producer, the big fan, the young, aspiring gamer who loves to express their love for video games in video form—shakes things up and draws hundreds of thousands of gamers to their cause. By the way, JJ, it's pronounced "toe-TILL-oh".